After a quiet holiday in the country with his family, Charles Lenox returns home early when he receives a cryptic note from an old friend. Gerald Leigh and Charles were unlikely friends at Harrow; Charles was a fairly “by-the-book” student while Gerald scoffed at the rules and eventually left school early. Charles was from a well-to-do family; Gerald’s attendance at Harrow was paid for by a mysterious benefactor. Although different, the two boys found common interests and deep, respective friendship, and the search for the identity of Gerald’s mysterious benefactor was Charles’ first, albeit unsuccessful, foray into detecting. Gerald’s note is choppy and distracted, but Charles feels compelled to help. His intent for assistance turns into alarm when Gerald fails to appear to meet as promised. Charles deduces some potential places that he may be hiding out and when he finds Gerald, he is discovers two shocking things. One, Gerald has been bequeathed another, more substantial bequest, and someone is trying to kill him. Committed to helping keep his friend safe and finally solving his first case, Charles plunges into the scientific world of the Royal Society. In the years since he left Harrow, Gerald has established a name for himself through his scientific discoveries; is it someone from his present, or from his past, that is trying to kill him? Further demanding of his time, Charles’ detective agency is on retainer for smaller cases in Parliament. A recent rash of thefts has proven elusive and dangerous. With his quintessential English stoicism, Charles strives to help both his friend and his country. With the tenth book in the Charles Lenox series, author Charles Finch has something that few authors of long-running series can claim: he maintains consistent quality stories. I find that with some authors who have a dozen or more books in a series, there are a few that just don’t maintain my interest or have a consistent quality. All the Charles Lenox stories are excellent, and I think the main reason is the character of Charles Lenox. He is an intelligent, charismatic protagonist with a refined, calm demeanor. That is not to say he is perfect; at times, he is arrogant, aristocratic, and flawed. He is human, from his flaws to his attributes; he is also very likable, someone I would like to have tea and an intelligent conversation with. The series relies on diverse plot-lines with some adventure, but bottom line is that the protagonist solves the cases through good, old-fashioned detecting. I don’t want to insult them by calling them “quiet” stories because author’s witty and elegant writing style keep the reader fully engaged, but he doesn’t feel the need to always include some grandiose, cliff-hanging escapade in order to solve the case. I also enjoy the subtle history lessons that author weaves into the story. He discusses how advent of the telegraph brought both progress and problems to Parliament and how the English custom of driving on the left came about. The secondary characters of Edmund, Jane, Dallington, and McConnell reappear in each book to help maintain the consistency of the plots and help to ground Charles into the life of a gentleman. I look forward to their appearance in each story; their own personal growth and development as characters further influences and defines Charles’ own personality. This series would appeal to anyone who likes a classic English mystery. The author’s grasp on history is similar to how Tasha Alexander weaves together events, customs, and principles of England in the late 1800’s. 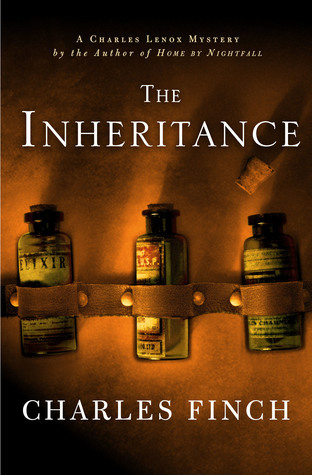 This entry was posted in Book Series and tagged 1800's, Charles Finch, Charles Lenox, England, Harrow, Parliament, Royal Society, tasha alexander, The Inheritance on November 14, 2016 by kvgaughan.